I’ve been a bit quiet on the blog front. My art energy has been missing since working on Karen’s book. Anna’s book rests on my desk, awaiting pencil and other tools. It will get attention, but I’m still trying to regroup my brain. July has been a purging month. Quite a few items have left our home/garage, helping to make space for work (and possibly art!). The biggie was finding a home for the giant mural from the Camas Project last year. 7 full door panels, collage, pastel, charcoal, and paint. About 19 feet long. Today I pulled out a full sheet of Rives BFK, split it and started cutting cells. I’ll talk about it more as things progress. Testing the camas sculptures in high temps at home. We’re in yet another major heat wave, reaching possibly our highest temps of the summer thus far. It’s already moving beyond 104F (yes, 40C!) at 4:30pm. 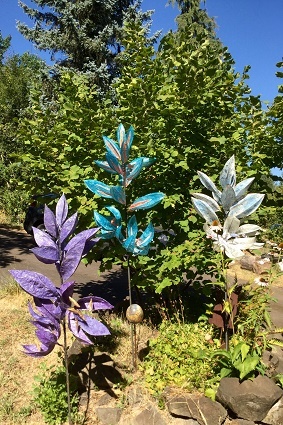 I now have 3 of the camas sculptures outside to see how they fair in different weather conditions. Today they are rather glossy, since encaustic wax DOES melt. By tomorrow, they will be firmed up again and ready to take on yet another brutal heat testing day. Personally, I feel like a melting Popsicle right now! Did I mention we don’t have AC at home? I’ve never had it, not even growing up. Tonight I’ll be putting the cars AC to work on the way up to Portland and the Guardino Gallery. A friend, Diane Archer, is one of the featured artists along with ceramic artist Michelle Gallagher. I met Diane many years ago during my time with Corvallis Fall Festival. She creates fabulous work and I think she is one amazing woman! Always a treat to see! So, if you’re in Portland, swing by the gallery. It’s over in the Alberta district and features some incredible work. I’ll try to get back into the swing of posting again as this new project progresses! Urgh, I checked the temp and we’re at 105! At this rate, we might reach 107! Whoa! Though they do look just lovely! I am hoping that they will survive, I do love them! Since people seem to want them as outside sculptures, I’m giving them a whopper of a heat test this summer. Now, if we could only get a little rain…. Something that makes a difference! I hope you are enjoying your winter months. I’m craving cooler temps. Maybe next week will bring normalcy. At least for a while. Gale, I’m with you, just a bit worn down. I love your sculpture. Funny, not funny, but I suppose a sculpture typically is assumed to be outside…perhaps size dictates placement. I’m sorry to hear about the heat in OR. I was in LA a few weeks back and it felt mild. The heat must be pushing up the coast. Hopefully things will cool off and motivation will kick in for all of us. It’s interesting to hear what people think of sculptures and then think about my own response. Size certainly plays a part in where things get located, but I never even considered placing the Camas outside until being invited to the garden event. Go figure! We finally got a break in the heat. Yesterday the clouds pushed up from the south and a few sprinkles fell. We certainly needed that break! However, the real need is water. Trees are already showing hints of fall color. I have ash trees across from us that are now totally yellow/brown. (I suspect they have died). I have my fingers crossed for our big ponderosa pine. It’s branches continue to sag lower and lower, even the needles are wilted looking! It’s kind of frightening to think summer isn’t over yet! I wish it was for the hopes of fall rains. So glad you made it back to CA! Loved all your sketches!